J. Cotter Gallery has been in town since 1970, and many of their pieces are inspired and created in the heart of Vail. The tradition known as Valentine’s Day also happens to occur during the month of February, so if you find yourself skiing powder while wondering what jewelry item you can pick up here in Vail, then know that you’re not the first person to experience this. Valentine’s Day in Vail creates a great opportunity for you because you can symbolize your affection for your loved one while also creating a special reminder to yourselves to get back out into the mountains, all while fulfilling your gift-giving duties. Here’s some suggestions for Vail skiing and mountain lifestyle jewelry pieces. J. Cotter Gallery’s humble shop resembles an art gallery more than a jewelry store; the necklaces, rings and bracelets convey the beauty of the mountains in rugged peaks, crystal clear streams and windy groves of aspens. J. Cotter Gallery has been in town since 1970 and many of their pieces are inspired and created in the heart of Vail. Picking the perfect piece is a personal experience there — the choices are many — but when it comes to pleasing a powder-loving valentine, the First Tracks collection might be just the item. Beautiful necklaces or earrings inspired by the line skiers make in the fresh snow will definitely bring a smile to the face of your loved one, reminding that person of that early powder day you experienced together. Also, look for the J. Cotter V necklace, a local classic that may remind you of the V that can be seen in Game Creek Bowl from the west. Lionshead Jewelers and Lamina in Vail Village are the two stores in town where you can find the iconic Vail Coin jewelry collection. Designed in collaboration with Vail Resorts, the Vail Coin is a souvenir item unlike any other. It has an interesting backstory, starting with the legendary Vail manhole covers and tales of theft, fencing and underworld dealings. The hot item was so in demand a spin-off in the form of jewelry was bound to emerge, and through that inevitability we now have the Vail Coin jewelry collection. In the collection you can find pieces ranging from earrings and charm necklaces to money clips and golf pins. One side of the coin has the inverted V logo that represents Vail Mountain, while other side has one of the three most famous symbols of Vail — the Gore Range, the Clock Tower or the Covered Bridge. Designs come in silver, oxidized silver finish, or inlaid with semi-precious stones — turquoise for the blue skies, mother-of-pearl for the snow on the mountain and Vail logo, and jasper for the clock tower and covered bridge roof. 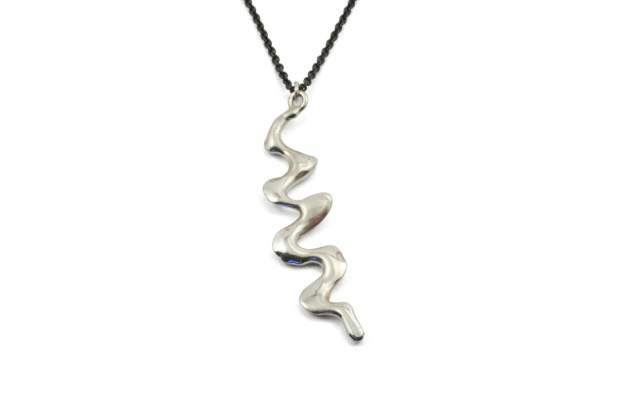 Another piece of jewelry perfect for the avid skier or just anybody who appreciates beautiful things is the skier pendant available at Kimberly’s Fine Jewelry. The small jewelry store in Edwards has beautiful pieces catering to its unique clientele of sophisticated shoppers who also love the mountains and their outdoors activities. Pieces such as the Ski Pendant or the Bike Pendant, available in variations of silver, gold or embellished with diamonds, would make a perfect Valentine’s gift and carry great memories from the mountains. For many who want to subtlety proclaim their love of the Vail Valley to the world, a single symbol has emerged over the last five decades – The Golden Bear. Golden Bear necklaces are passed down from generation to generation in Vail, and at its flagship jewelry store in the village you can find an entire collection of bracelets, necklaces and earrings adorned with the timeless bear design. In addition to the signature bear jewelry, the Golden Bear carries a great variety of contemporary pieces such as their two-tone collection, the hand hammered collection or the sterling silver collection. The Golden Bear also has a selection of cufflinks, money clips and cigar bands, all containing the legendary design.